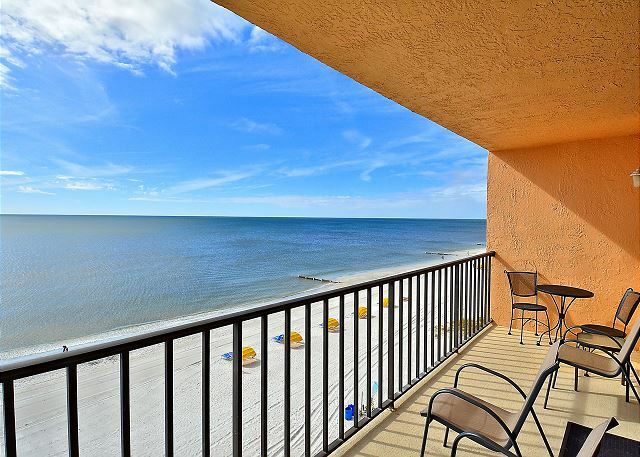 Light, bright and comfortable describes this top floor Gulf front condo. And, it has a fantastic view of the beach from the living room and both bedrooms as well as the balcony. The sunsets are second to none. 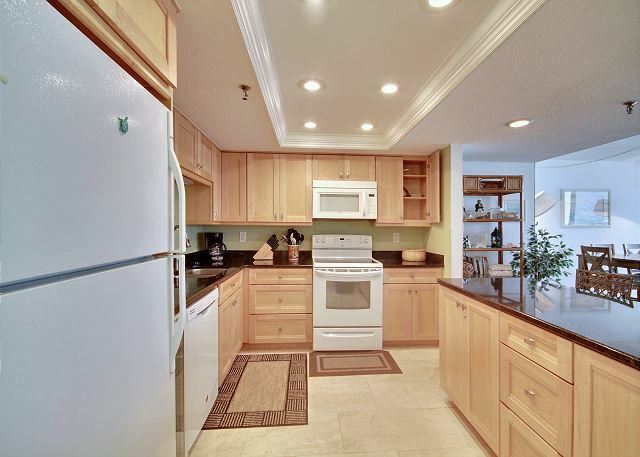 The kitchen is totally remodeled with Granite counter tops and is fully equipped. 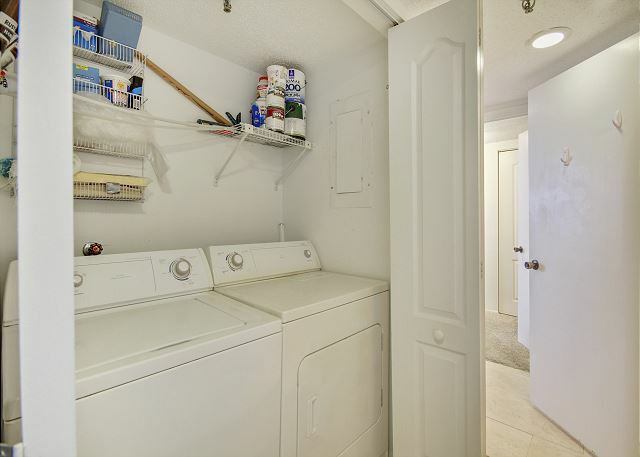 Your condo has a washer and dryer for your use. You also have 3 flat screen televisions and free wireless DSL internet service. First Time In This Condo and Loved It! This condo is perfect for a family. It has a large living room for visiting and everything you need for the perfect vacation. Very clean. Wonderful to hear! Yes, the floor plans at The Trillium are nice and roomy and we are glad you all were comfortable in this condo! Thank you for choosing to stay with us and we hope to see you back for another visit to Madeira Beach soon! Spent a wonderful spring break in this condo. The best part was the amazing view from this 5th floor balcony and the expansive windows across the front of the condo. We watched whales every morning! The beach in front of the condo was uncrowded and quiet, unlike the beach just a bit north. Condo itself was clean and functional. Only complaint would be the master bed was hard as a board. Overall it was perfect, would love to come back sometime! So great to hear, thank you for sharing! :-) We are so glad you enjoyed your stay in this premier condo, the views here really are awesome! Bedding we do understand differs for everyone's preferences but we will be sure to share your feedback to the owners. Thank you so much for spending your spring break with us and we hope to have you back for another visit to Madeira Beach!! We had a very good rest and a reallly good vacation. A wonderfull view and a magic sea that never was the same when we awoke. 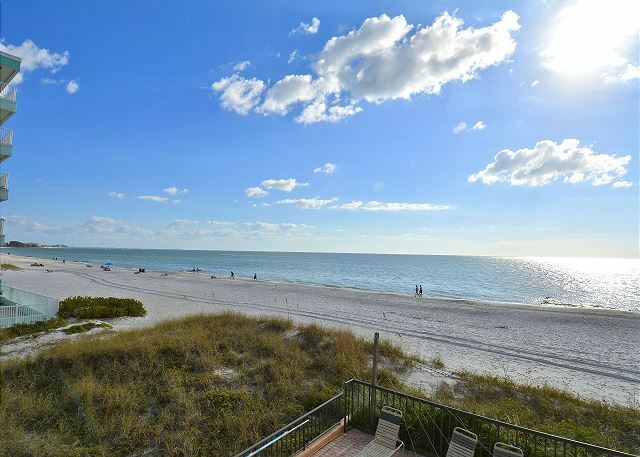 This is great, so glad you enjoyed your time in this premier condo on Madeira Beach!!! :-) Come back for some more R&R soon!! Great quiet location with a beautiful beach!! Great place to stay with an unbelievable view from the 5th floor balcony. Great family location and no over crowding on the beach. The unit is in great shape and very clean. Master bedroom is very large and both bathrooms were nicely decorated and spacious. There was LOTS of beach items in the unit to use and they came in handy!! The only issue we had was that the keys to get into the lobby at the resort were hard to get into the locks. You needed the key to get into the lobby every time you needed to get back to your room. Maybe the locks might need changed. We weren't the only ones complaining about it. Needless to say we would definitely stay here again. Wonderful to hear! 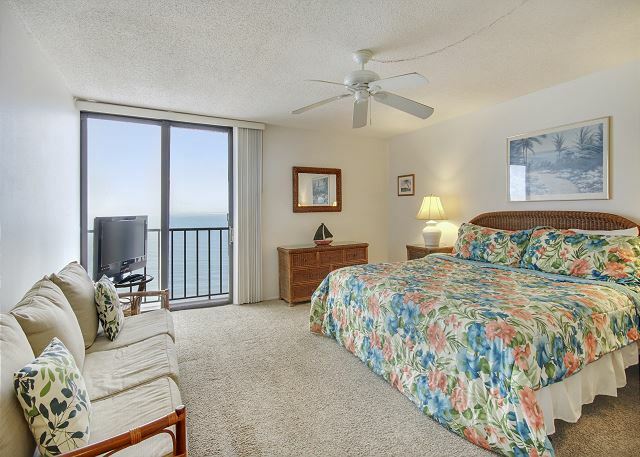 :-) We are so glad you enjoyed this premier condo on Madeira Beach and that you were comfortable during your stay. We apologize for any troubles you had with the keys to the lobby.....we are taking a look into this to be sure it does not provide others with the same troubles. Thanks for letting us know!!! Thank you for choosing to stay with us at the Trillium and we look forward to having you back for a future visit! If you are looking for a vacation rental with lots of room and a great layout then Trillium #5B is the condo for you. The views were the best I have ever had from a beach front condo and the beach itself was only 80 steps from the parking garage. Unlike many large condos we did not have to wait and wait on the elevator plus the other guests were quiet and very respectful. Resort Rentals was super to work with and I would highly recommend them. This was by far the best experience I have ever had renting out a condo. Awesome to hear!!! 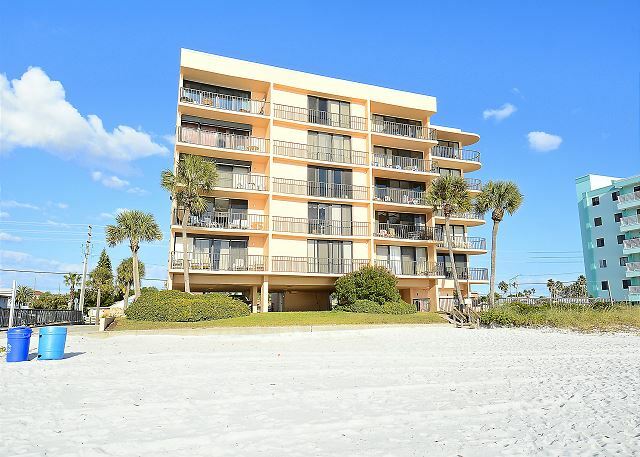 We are so glad you enjoyed this premier condo at The Trillium on Madeira Beach and hope to have you back for another visit! Thank you for staying with us!! Very nice beach front condo. Condo very nicely equipped for a comfortable stay. Excellent location. Great to hear!! So glad you were comfortable in this premier condo at The Trillium and that you liked the really is GREAT!! Thank you for being our guest and we look forward to having you back for another visit! Great to hear!! So glad you were comfortable in this premier condo at The Trillium and that you liked the location; it really is GREAT!! Thank you for being our guest and we look forward to having you back for another visit! We had a very nice stay in this condo. Trillium has a great location and you can enjoy the stunning view from the balcony from early morning until the beautiful sunset. You can go to a walk on the sandy beach and watch the dolphins - you can watch them from the balcony or from the beach they are swimming parallel to the beach almost every day. The condo is nice furnished and comfortable, the kitchen is good equipped. We were really satisfied with it. We come back next year again. Last but not least kudos to the staff of Resort Rental - all of them are always very kind and helpful at any matters in a blink. Many thanks for all of you and especially to Janet. Thanks so much for this post!! :-) We are so happy that you had a good stay in this premier condo at The Trillium and that the dolphins put on a good show for you!! They are just amazing to watch! Thank you for your kind words about our staff, we are more than happy to help how we can and want to be sure you are comfortable during your time with us! Thank you for being our guest and we look forward to next years visit!!! Wonderful Unit, great location. Parking tight, but this unit's parking is NOT under the building which means vans and trucks are okay. We are so glad you enjoyed your stay in this premier condo at the Trillium, it really is a lovely updated unit and we are so happy you liked it!! :-) Each condo does provide a specific parking spot either under the building or out front; glad it worked out perfectly for your truck! 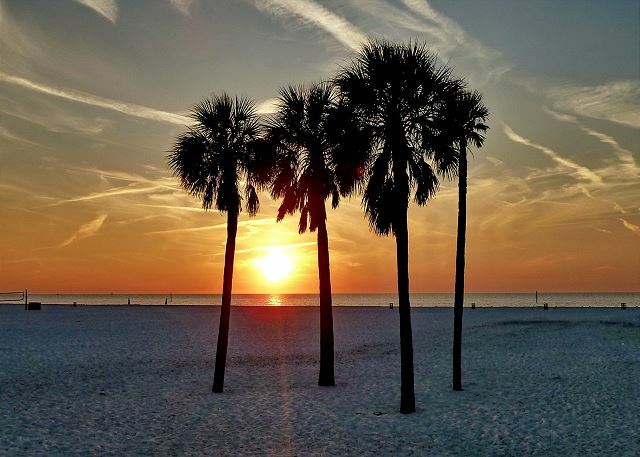 :-) Thank you for being our guest and we hope to see you back on Madeira Beach for another beach vacation soon! We had a wonderful stay and our vacation was excellent! That's what we love to hear!!!! :-) We are so glad you enjoyed this premier condo at the Trillium and we look forward to seeing you again for another beach vacation in the future! Simply Amazing! Closest condo to the water. There is no condo closer to the beach. Top floor of five is PERFECT for whale watching and dolphin watching. Close enough you can see your kids play in the sand. Roomy enough for an entire family for sure. 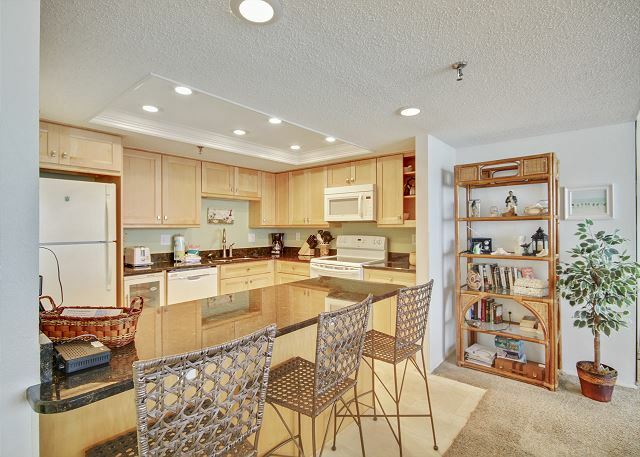 Walking distance to grocery, eating out, and trolly distance to anything else on the blvd. WILL stay there again! So, so great to hear!!! 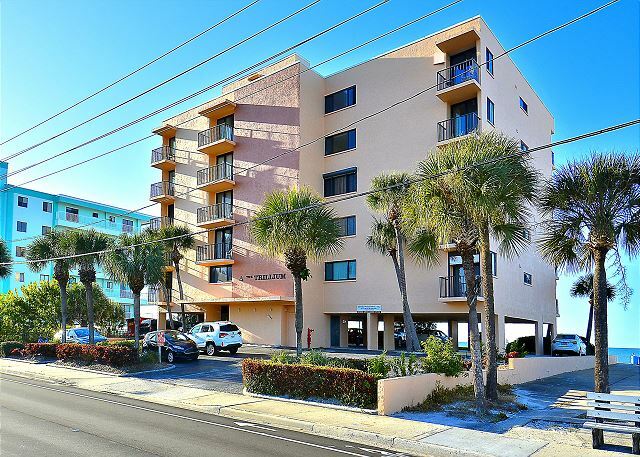 :-) The location of this building on Madeira Beach is very ideal and we are just thrilled that it worked for your family vacation all the way around! This is a lovely condo that falls into our "premier" category with recent updates and we love that you were comfortable with everything. Thank you for staying with us and we look forward to having you back!! wonderful location, tons of eating options. Probably the closest location to the beach you will find. Unit is clean and has a superb view. Beds could use some updating. Grounds are well maintained and clean. We have been staying here for 15 years and It never disappoints. Wow, 15 years is awesome!!! :-) We are so glad you enjoy your time here, it really is an ideal location on a beautiful stretch of beach! We will be sure to pass over the feedback on the beds to the owner for their review. We do understand that everyone's preferences in that department does vary but we will take a look at this, thank you for letting us know! Thank you for staying with us and we look forward to your return visit! The condo and beech were perfect!!! Location, view, cleanliness, closeness to beach just to mention a few. Never wanted for anything--very well stocked. Already ready to go back! So great to hear!!! We are glad you enjoyed this premier condo at the Trillium and we look forward to your next visit! Wonderful vacation and birthday. The staff at the rental were great. :-) We are so glad we could celebrate with you!!! Thank you for spending your birthday week with us and we look forward to your next visit to our area! Rate was more expensive than I have paid for similar unit in Trillium at same time of year. Was told it had been recently remodeled so apparently guests are helping pay for the remodeling or owner is taking advantage of raising price due to rental during spring break. Thank you for your feedback. We do have 2 different pricing tiers for our 2 different categories of condos and it is true that the premier status condos do carry a bit higher price point. The pricing for our premier units varies, but it is generally about $75 - $150 additional per week based on the individual unit. Our pricing also fluctuates throughout the year and the time period that you stayed was during our “peak” season so therefore was the higher rate based on the demand of the season, not because owners are taking advantage of anyone! March is one of the busiest months out of the whole year on the beaches and that is the time when you find the highest rates. All of our seasonal rates along with the corresponding times of the year are all listed on our website under the “Rates and Fees” tab so if you ever question what you think the pricing will be, that is where you will find the accurate pricing for our inventory throughout the year. Each location will vary and all are found on that same page. Our website will also provide the best rates of our inventory over any other booking sites. Thank you for staying with us and we hope to have you back for a future vacation. Perfect for us. Great access to beach and pool. Thanks for the post! 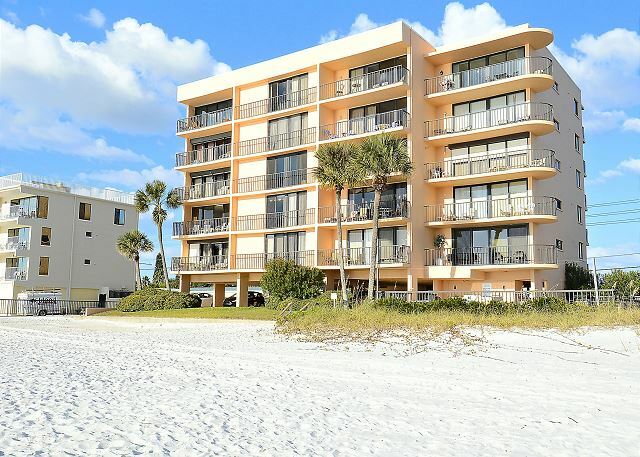 We are thrilled to hear you enjoyed your stay in this premier condo at the Trillium on Madeira Beach, it really is a great spot!! :-) Thank you for being our guest and we look forward to seeing you back on our beautiful beaches again soon! We have stayed at the Trillium many times but this was our first time staying in 5B. It is a very nice condo and a big plus is you can view the ocean from both bedrooms and the living room! The kitchen is very well stocked and there are at least 4 beach chairs and several lounges. Also beach umbrellas are included so you don't have to bring those or rent them. We did have an issue with the fan in the master bedroom not working but one call to Resort Rental and they sent someone out to fix it! The balcony is so nice with table and chairs. We would stay there again! I can't wait to return! The condo was great! Just what the pictures looked like. The view from condo was amazing and it was perfect. Great location with lots of restaurants and shopping close by. The beach was amazing. The agency we rented from "Resort Rentals" were great to work with and the customer service A+. Clean, but older condominium. Kitchen & bathrooms are updated, but otherwise could use some love. One elevator in the building & it's slow. Rental office 6 miles from the building. Loved the beach access; quiet and peaceful location. Kitchen was well-equipped. hallway looked very dirty in spots. Needed maybe a good scrubbing. Location was great. Had a wonderful time. Would come back again. Thanks for the post! During your next stay should you find any housekeeping issues that may need to be tended to, please do not hesitate to contact us at the office! We have staff onsite and we are more than happy to come and take care of anything that you may need. In regards to the sliding glass door to the balcony, unfortunately that is quite common here due to the salt air coming in from the beach. We apologize that it was tough for you but again, please feel free to call us if that should be an issue and our maintenance will come out and give it a little extra lubrication to make it easier for you. unit was very nice. great location. only 2 issues. ceiling fan in master bedroom didn't work very well and A/C could not go cooler than 70 degrees. Had a fabulous vacation . 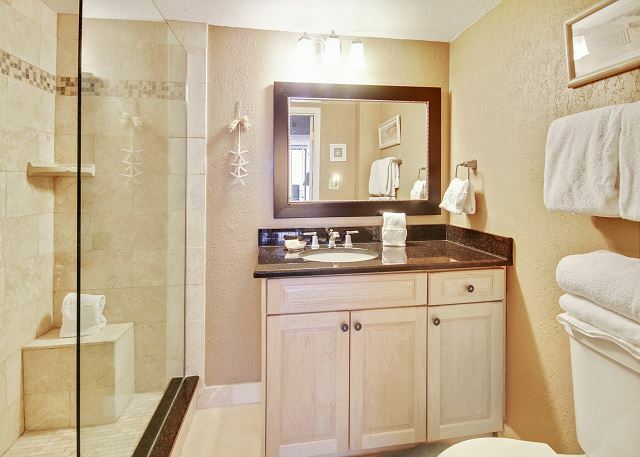 Trillium #5B is a beautiful Condo and has all the amenities that you would need. Very clean-updated and maintained. The location and the view were spectacular. This is our second visit to the area and will definitely come back. Loved the unit! It had everything we needed and more! Great room, loved that every room opened to the ocean! Great location! So happy with it! Nice unit that is well updated and in a beautiful location. Superb location with a great view. Sitting area is looking a little tired and some of the slats on the vertical blinds are missing. Bathrooms have been updated and bedrooms are fine apart from a squeaky bed base in the master bedroom. All in all though a great vacation. Love the Trillium. This was our 3rd time (2nd renting from Resort Rentals) staying here. We couldn't have asked for better weather and a more relaxing vacation than this. We will be back very soon! 8 years staying at Trillium and it never fails to be the best vacation. The Trillium has been my vacation home for three years now. Every apartment has its charms and the building is close to everything there is to see in the area, not to mention directly on the beach! We spent the month of January in Trillium 5B & found it one of the best rentals we've ever had. The kitchen was extremely well-stocked with even casserole dishes and baking pans. The beach views and sunsets were unbelievable, and there were at least three ice cream shops within walking distance. Hoping to rent this place again! Everything about this condo was perfect. The owners provided everything for a comfortAble stay. Only issues were the rental company. Half way through our vacation keys to the building were changed-- no problem. However, we were also issued new unit keys. They didn't work properly and it was another trip to the rental office to Change addition were not informed of the construction going on in the unit next to us.Despite the difficulties we had a great time. Thanks for your review. Sorry about the key situation and the remodeling in the unit next door. Unfortunately since we do not rep that condo we were not aware it was scheduled. We do try to avoid those issues when we can but sometimes its just not in our power to control. Thanks again for your review and we look forward to seeing you again next year. Our condo was clean and comfortable and exactly as pictured. Wonderful views, quiet beach and centrally located to all sorts of shops and restaurants! We loved the location, and the unit was very nice. We especially liked that both bedrooms had gulf front windows. Only two minor issues: 1. There were a lot of tiny little ants, mostly in the kitchen and bathroom. 2. The kitchen could have been a bit better supplied with utensils, pot holders, etc. Overall, we enjoyed our stay immensely! The condo is very nice, really large and comfortable. 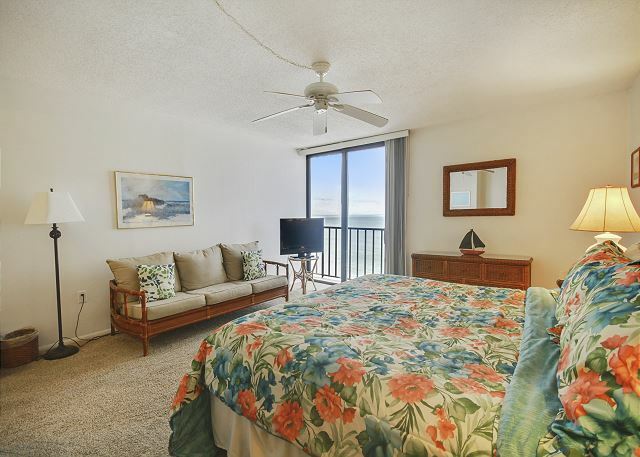 Right on the beach with ocean views and balcony in living room, 2nd bedroom and master bedroom . Knifes need to be sharpened but all other equipment was in good condition. Bedding very comfortable, good pillows etc. Great restaurant, Dockside Dave's within walking distance, don't miss it. Loved everything about the unit. Was very clean with a Golden Girls décor the views from the balconies were breathtaking Love to return! Have used condo 5b for the past three years, during the month of November, always a pleasure to visit, rental staff always pleasant and helpful, condo is now showing a little 'wear & tear', but always bright and clean, that's why we keep using the same condo. Many thanks. Enjoyed our stay....everything was perfect. Terrific location - sunsets and waves crashing! You will never want to leave the balcony which has nice furniture (not the plastic ones some of the other units have), and it is "the penthouse". This home is a great size at over 1,300 square feet and has all of the amenities of home. The kitchen is updated with all of the utensils and equipment you will need and an open concept so you are never without a few. The living room has comfy furniture, and a small dining table offers great views. The master bedroom is huge!!! The 2nd bedroom has 2 twin beds. 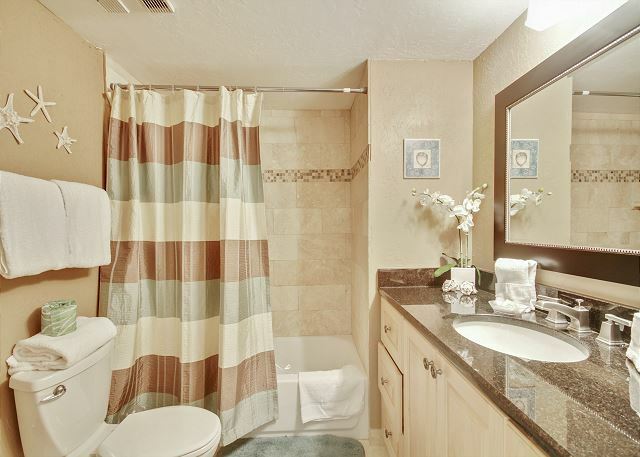 Two good size bathrooms, and there is good sound quality if one of you likes to go to bed early. We loved that we could wash our clothes and the towels with the full size washer/dryer. We were pleasantly surprised at the beach chairs and umbrellas left by others. Need to know: Bring beach towels or take a trip to a discount store off the beach to purchase, some cleaning supplies were missing (we got some inexpensive stuff at Walgreens), and the bathrooms are a bit dated but they are clean. It looks like they updated the kitchen recently, so perhaps the bathrooms will soon follow. We had a beautiful stay in Madeira Beach. Its our home away from home. There were ants on the counter that got into some cookies and were a nuisance all week. The condo was great! Very roomy, cheerful, bright and decorated well. The have everything there you would need. Check out the hall closet by the front door all the beach supplies you need are there. We have only one down side. SUGAR ANTS/GHOST ANTS all the units in the building have them. Thanks so much for your great review! I am so glad you enjoyed the condo. Sorry about the ghost ants. Unfortunately they are very common in Florida and tend to show up after heavy rains. In the future please don't hesitate to let us know if there is a problem. All of the condos are sprayed monthly and if a problem arises we can call the company back out. Thanks again! We enjoyed our stay at Trillium #5B condo. It was very nicely furnished, roomy and comfortable. The beach was a little to busy for us. Great get away place to stay! My sister and I always take a week from our everyday lives to get away from it all and we stayed at this unit at Maderia Beach. 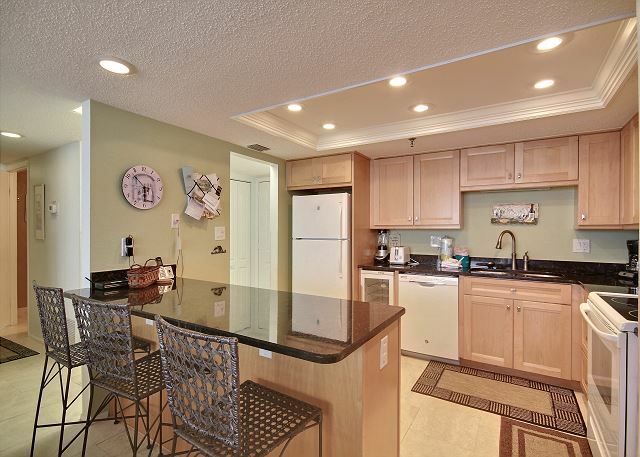 This unit was very clean, and had all the amenities you could ask for, even beach chairs and umbrellas. The only drawback was the refridgerator which had a strong smell of fish. The screen door and glass door off living room patio did not close properly or lock. Other than that we were extremely satisfied with this property. We would definetly return. Thank you! Love the location. Quite at night close to everything you could want or need. Great views. Thanks so much for the great review and kind words! We will see you next year! This was the first time we stayed at the Trillium, coming to Maderia Beach for about 30 years. The condo, although somewhat dated, was exceptionally clean. The kitchen was remodeled and was very pleasing. It was perfect for our needs. Location was very convienent. We hope to return next year to the same condo. Spectacular view with beautiful sunsets! We were pleasantly surprised. Upon opening the door, the view was unbelievable. The property was clean, spacious and quiet. It is conveniently located near nice restaurants and Johns Pass for your souvenir shopping. We are looking forward to visit again next year. We loved the condo. Location was great. Everything was clean. Bedrooms were a great size. Beach was beautiful. Only a few small things, it is an older building, so the elevator was very slow and a little smelly. The beds and kitchen were nicely decorated, but the furniture in the living room was a little dated, and looked like chairs could use some new cushions to make it a little more confortable. Pool was on the small side, but the kids still had a good time in it. Luckily we were usually the only ones at the pool, it there had been another family there, then the pool would have been too small. Other than that, we really enjoyed everything and would Definatley reccommend this condo. We were there when tropical storm Debbie hit. The balcony doors did not shut all the way(airtight) so there was a loud whistle from the wind that scared our daughters and caused us all to have trouble sleeping. Once Debbie left it was fine. The air conditioning kept going out too, but I think that was due to the storm. The beach and pool were cleaned the day Debbie left and we were able to enjoy the rest of our vacation and finally got to see dolphins swimming off our balcony the last day we were there. The bathrooms could use some updating as the nozzle to turn the water on and off was very hard to push in to turn off in the master bath and the light fixture was broken. The matress in the master is also VERY firm. Condo unit 5B was good. Could use an update on bathroom vanity and fixtures. Can't understand why there is no closet in second bedroom. (there are 2 in the master bedroom) This would be more inconvenient for 2 couples sharing the condo raher than one family. We really enjoyed our stay in this condo. Biggest problem was the building's hallways were dirty looking and a little smelly. Carpet on the 5th floor hallway in particular was worn and dirty looking... it would seem to me some type of flooring other than carpet would be much more appropriate. This is the 2nd time that we've stayed at the Trillium and we've already signed up for next year. 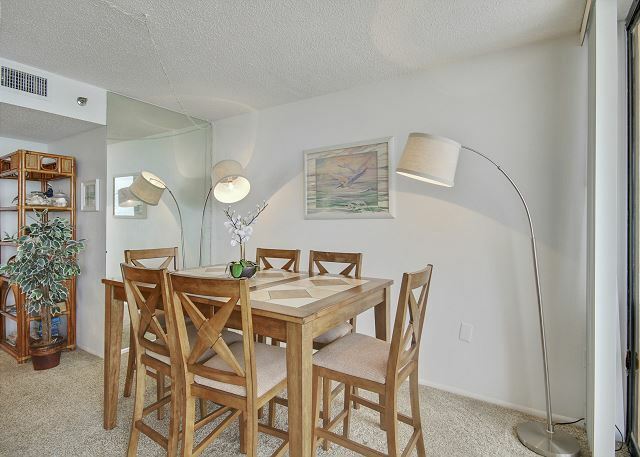 The condo, view, and proximity to restaurants and stores are great. One issue was that the dishwasher needed some work, but we reported it and I assume that it'll be fixed soon. We occupied different condos in this building. 5B in the Trillium rates on top our list. There is a golf view from each room. The deck when we have been there is protective from the breeze making it conducive to sun bathing even if it is too cool everywhere else. Great beach and good location. My experience was wonder, looking forward to returning. Very fast & very easy-clean and neat.I am a person of very few words. 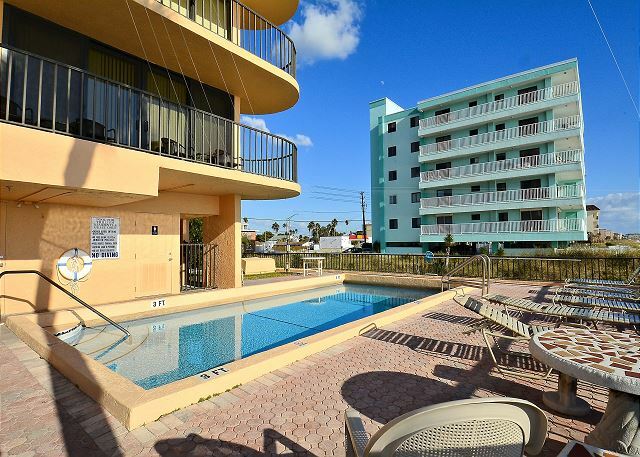 Very clean, bright and practical condo.Stayed at Madeira Beach for over 15 years, and I can say that this is one of the best or the best that we have rented since coming to the area. Trillium is small and quiet, (only 15 condo's in building). We thoroughly enjoyed our three weeks stay! Every aspect was what I expected. First and foremost, it was clean. The condo was spacious and we had absolutely magnificent view of the gulf. I will say this, the next time I travel down for a vaction, I may need a biiger place. Resort Rentals will be the first call I make. You can tell, they just "get it". You want to make your choice of where to stay and then not have to worry about that aspect of your vacation. I would highly recommend them if you are looking for a condo or house in the area. My wife and 2 year old had a great time. We have been staying @ the Trillium for years, and am sure you have many return visitors. Whatever or however you do it, don't change. It works and it works wonderfully. This the second year in a row that we have used Resort Rentals and we couldn't be happier. This years stay was at the Trillium 5B in Maderia Beach. We have been vacationing in the area for over 40 years and this years stay at the Trillium was the best. you Resort Rentals for helping us have another fantastic vacation! First time at Madeira Beach. Beach was beautiful, condo was very nicely decorated and spacious. Plenty of room for 5 adults! Great extras like several beach chairs, a cooler, umbrellas, etc. I realize these are probably there because other people leave them (we left several tubes and rafts for the next guests) but it was great to have them! The only negatives to the condo were few: the air conditioning took forever to get cool - and you can't set it below a certain temp or it will freeze & the vertical blinds in the living room and bedroom were missing several pieces and really need to be replaced. The downfall with the building is management will not allow anything in the hallways - rafts, coolers, chairs, etc (perhaps a fire code violation) therefore you are dragging sand into the condo constantly. The pool is very small - the posted maximum capacity I think was 9 people. But it was sparkling clean and felt wonderful after a hot day at the beach! This complex is centrally located and we found plenty of great dining options a short drive away! Very nice place to stay. Will definitely return there next year! Great Piece of paradise !!! we have stayed in thr trillium a couple of years ago and decide since this years visit it will be our favorite future vacations spot...i'm not sure there could be a bad condo in the place!!!!! FANTASTIC!!! We have stay in this condo several years. We love the location, it is very convenient to shopping, dining and entertainment. Furniture could use updating. Rattan chairs were not very complete sets of Pots, Pans, and glassware. Kitchen faucet felt like it was ready to break at any minute. These are mostly minor complaints except for the chairs, especially since the weather was not great and we spent more time indoors then expected.Everything else was very satisfactory!